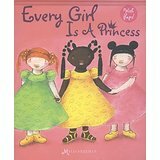 I don’t necessarily advocate filling girls’ heads with fantasies of being ‘princesses’, but on the other hand I am committed to the view that there is beauty to be seen in all colours and ethnic backgrounds. This should therefore be reflected in images that surround us. It was in the 1970s that I first thought about the portrayal in the media of girls and princesses. When we were in Malaysia we had friends who were from Northern Ireland. They came from different sides of the religious divide and had left their hometown of Newry on the border between Northern Ireland and the Republic of Ireland. Later they settled in Northern Australia. Eileen, the mother raised a topic that I had never considered in those days. She asked “Why are all heroines and princesses in story books and films portrayed as blond with blue eyes?” She was most indignant about this, as their daughter had lovely brown hair and brown eyes. Naturally she wanted to see a brown haired, brown eyed princess! 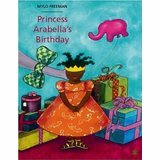 The Princess Arabella books are now famous in Holland and beyond, but publishers worried Arabella’s ‘uncombed’ hair might be considered offensive in the US. Someone in our local U3A group (A shared-learning organisation for retired people) has started a film study on animated films. She announced that Disney had at last decided to feature heroines from different ethnic backgrounds. 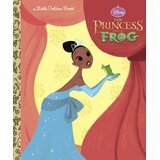 A few years ago I had pounced with joy on the film “The Princess and the Frog’, which starred a delightful black girl and followed her as she grew into a beautiful young black woman (although for a while she was a frog!!). I bought a Tiana doll for our black granddadughter, Mia. 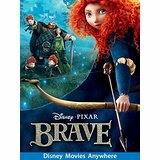 At our U3A session in June, we watched “Brave” – another Disney film that highlighted a minority culture – Scottish people, many of whom had red hair. Princess Merida Certainly had glorious red curls And I find that very good, as we do notice a large number of people with red hair when we go to our beloved Scotland. Our study of animated films began with a strange but extremely skillfull film entitled “Strings” from Sweden. The entire full-length film was played by string puppets. I don’t remember whether there were any princesses in that film. I do remember a lot of strangeness and fighting. However, I am glad that it came from Sweden. 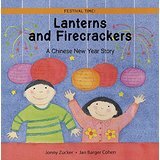 I can only say that the more one learns about other cultures and backgrounds the better. Learning about other cultures in school. Jah’s little daughter has been “doing” China in their latest school project It was lovely hearing her tell me about what she has learned about China and Chinese children. She is now aged eight years old and at such a receptive age. I am grateful to her school and to the teachers for widening the children’s horizons. Schools can be such great places in so many ways! On 13th June on the Today Programme I heard about a German book for children about the life of a refugee child. Apparently it is becoming a best seller. I have tried to find out its name. Sorry that I have not yet found it. If any reader can tell me the title I’d be most grateful. I love writing stories for children. I have had six books published and am working on others.